[Translate to Spanish:] Prominent Latin American church leaders, theologians and human rights defenders bring their particular perspectives to bear on the question "Where is God in Latin America?" in today's plenary session, and five puppets - typical "inhabitants" of the region - comment on Latin America's history and church life. This evening, participants relax and listen to different kinds of Latin American music, and attend a cultural show on "Singing and dancing for life and peace". 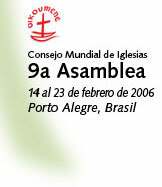 Esta mañana, los participantes de la Asamblea se unen a los miembros de las congregaciones locales de diferentes tradiciones en las iglesias del centro de Porto Alegre para celebrar el culto dominical.